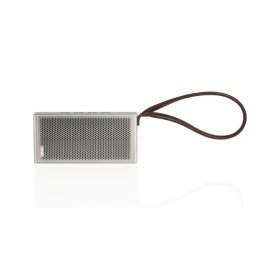 Loewe’s smart new lifestyle accessory is perfect for music on the go. Whenever. Wherever. Compact dimensions, outstanding audio and beautifully crafted minimalistic design make Klang m1 an ideal companion for everyone who loves music. It’s the perfect gift, or why not indulge yourself! 2x high/mid-range speakers and 2x mid/base passive membranes for an astonishing quality of sound from such a small package. Outstanding play time of up to 12 hours and a rapid recharge time of just 2 hours. Integrated mic for hands-free calling. Pair two Klang m1s together for 2x the output and stereo. Intuitive controls with LED indicators for battery life. High Tech PVD colour application process for a beautiful and hard-wearing finish. Rose Gold colour finish is 83% gold and 17% copper, applied 10x thicker than typical gold plating.